The internet has been ablaze with a particularly nefarious news story typically titled something like, “You’ve Been Making Your Tea All Wrong!”. Are you sick of hearing this? Yeah, so are we. And not only because there’s no “right way” to make tea. I’m currently calling this topic the Microwaving Tea Controversy. The articles about this are usually titled something like, “Expert Claims Microwaving Tea Is Best!”, or “Microwave Makes the Best Tea Says Science”. The Microwaving Tea Controversy has excited dozens of news networks because it’s the perfect maelstrom of click-baiting buzzwords, science, consumer errors, lifehacks, outrage, a popular television show, and a lovable beverage enjoyed the world over, tea. It began April 11 when an article was published by ABC Radio Sydney and repeated on their radio station. A character played by David Tennant on the show Broadchurch was shown microwaving his tea in a recent episode, and the natural response to this perceived “outrage” was lots of clamor over how despicable this practice is. This prompted ABC Radio Sydney to turn to Dr. Quan Vuong, from the University of Newcastle, who happens to perform research into how to make household foods more nutritious. Many of those techniques involve using a microwave oven. And here’s the clincher: he published a paper in 2012 that showed an improvement in the extraction of chemical compounds from tea leaves if the tea was microwaved. This one idea, that microwaving your tea actually makes it “healthier” by extracting more compounds, exploded across news networks like a thermonuclear bomb. And when I say exploded, I mean this article and the information contained within in it made its way to The Telegraph, The Guardian, ABC News, The Huffington Post, AOL, The Mirror, The Daily Mail, Business Insider, New York Magazine, the New York Post, Mashable, The Independent, Yahoo News, and Cosmopolitan, to mention just a couple. I’ve also seen it translated into French, German, Indonesian, Polish, and more. Equally popular, and a source of even more coverage, was the backlash against these articles, both by common Brits and by “tea experts” aghast at a recommendation of microwaving tea. In the end, everyone got to pat themselves on the back for either discovering a new way to make healthier tea or by holding fast to the perceived “wrongness” of this practice. The contagiousness and quality of these articles emphasize in a microcosm why current news media and social media are so virulent and backward. Why do I say that? Because every single news source got it wrong. Pour hot water into a cup with a teabag. But, what did the study actually say? A minor difference, yes. Inaccurate? Unless Dr. Vuong has retracted his study, absolutely. No matter what, we shouldn’t tolerate even this small of an inaccuracy in our reporting, especially when it comes to science! Because what happened? It got repeated again and again, without any fact checking, ad infinitum. But this isn’t really the point, is it? We don’t really want the news just to tell us what is. In part, we want the news to interpret events as well. Sadly, this interpretation went as click-baity as possible by claiming this was the “best” way to make tea, or the “tastiest”, or even the “healthiest”… and the worst part, all “according to science!” Let’s look at those claims, by simply referring to Dr. Vuong’s actual paper. Is it the “best” way to make tea? Absolutely not. Trust us, we’re World of Tea. Is it the “healthiest” way to make tea? The method Dr. Vuong describes increases the catechin content from 62% if brewed traditionally for 3 minutes, to 80% if brewed with his microwave method. The caffeine also increased by 15%. The theanine only increased a very small amount. Is this a significant increase? 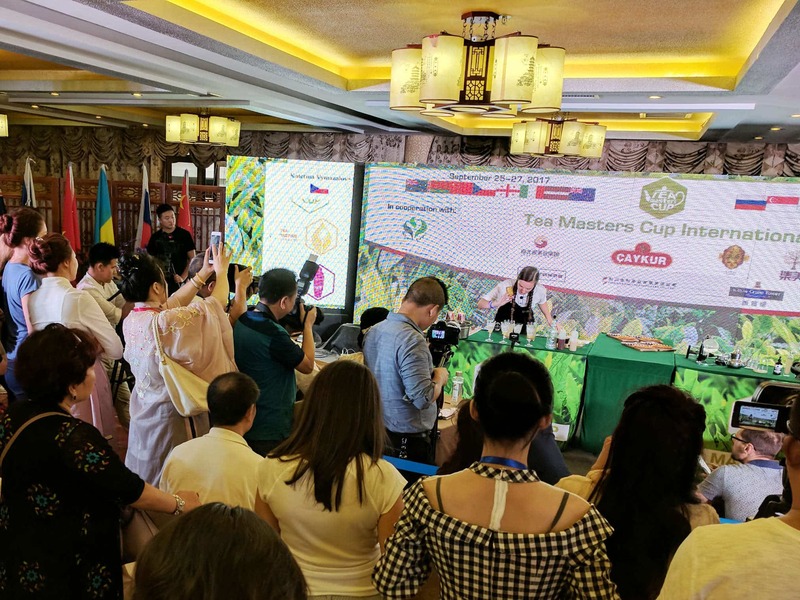 It is, in that it satisfies Dr. Vuong’s initial interest, which was to find a way to increase the water-soluble compounds in brewed tea through methods that people could use at home. There really is an increase! But is this slight increase really meaningful when it comes to health? Probably not. It’s not very scientific to not read the paper or to misquote it. In general, readers seem to have a faulty understanding of what science is, something I hope we combat here on World of Tea. So what is the best way to get the most from your tea leaves? Unfortunately, the solution here is so achingly simple that this all could have been avoided, although it’s doubtful that many would have found this an interesting headline. What is the best way to get the most catechins, caffeine, and theanine out of your tea? Or stack steepings in a single cup, gongfu style. The basic principle is that all extractions of tea leaves in hot water start a graph that builds towards that golden 100% maximum extraction. That is, the water-soluble compounds in tea react with the hot water and begin a march towards equilibrium in your cup. Thus, multiple steepings, or stacked steepings, literally restart this process each time you add water to your leaves and stack each steepings’ percentages towards maximum extraction on top of one another, getting ever closer to 100%. Dr. Vuong was comparing his percentages to maximum extraction, but all you need to do is stack the equivalent of 6 to 8 minutes of steeping (in other words, just two European-style steeps) to extract more compounds than the microwave method. If you’d like to know more about tea steeping and the chemical components of tea, check out our Kinetics of Steeping Tea, Chemical Compounds in Tea, or our article on Multiple Infusions. P.S. The tea used for the study was Twinings and Lipton… so make of that what you will. Great job as usual. I have done the test to microwave tea that i forgot i had stepped (chinese way) and want to drink it hot, i found the flavor reduces considerably…. Even better! Eat the tea leaves after your last cup of green tea. That gets you all the nutrition the tea leaves have without compromising the quality while drinking. I would only recommend doing so with Japanese tea though since it is much less polluted than Chinese tea. Would you explain the diffetence between te-steeping and “stacking”, a term I’m not familiar with? Sure! Re-steeping is saving your leaves after a brew to steep them again into an additional cup of tea. Stacking refers to brewing multiple small and short steeps in a gaiwan or small teapot and combining those multiple steeps into a single cup or pot. This method is used in some gongfu cha preparations. I still brew my tea as my mother did when I was growing up in England. As the water is coming to a boil fill the tea pot with hot water to warm up.As the kettle starts to boil, empty teapot of the warm water put in a teaspoon of tea for the number of cups plus one for the pot, cover with a tea cosy and allow to steep for 3 minutes. Milk and sugar first then pour the tea , stir and enjoy. I never use the microwave simply because pouring boiling water onto the tea or teabag in the teapot causes the tea leaves to burst and release all the properties in the tea. This is the way I have always made my tea and I’m sure there are purists who have different ways. I live in Middle Tennessee and introduced my knitting group to hot tea in a china cup several years ago. Hi Audrey, I agree 100%. My mum from England taught me to make tea the proper way and I thought the microwave article backed up our practices!!! Let’s keep these Yankees on their toes!!! Jordan, the careless reporting of facts about a tea study is just typical of the sloppy reporting in general today. I appreciate your actually reading the study rather than just carrying on the error. I drink a great deal of tea, black loose leaf, and am not that concerned about maximizing its health properties. I’m after the best flavor, and I don’t think that can happen in the microwave. Some of those news sources got the study details right. My understanding of the study was the same as cited here related to the methodology and benefits, the test results, based on reading some of those. It’s a minor point, but given the review here relates to getting details right it’s odd to get that detail wrong (“every single news source got it wrong”). Of course their method would make bad tasting tea, which they more or less admitted, and of course the options listed here are preferable. I’m wondering what sources it is that you’re referring to? Every news source I mentioned above related the exact same information that the original source of the article, ABC Sydney, reported. And what they reported, as detailed above, was incorrect according to the study that they cite (the one from 2012). How exactly did I get that wrong? Additionally, a majority of the sources cited above directly mention this method generating “better taste” or something of that nature, citing Dr. Vuong as the claimant. This could have been something he said in person, it’s hard to know, but once again is in direct contradiction to his own paper. The idea of making tea in the microwave is horrifying for purists. It’s argued microwaves are inferior to kettles for heating water, as there is less control over the temperature. But the microwave could actually be a useful tool for extracting more bioactives. Microwaves can actually increase the levels of bioactives in your cup. Adding freshly boiled water to the teabag, steeping for 30 seconds, followed by a minute in the microwave (medium power) extracts more bioactives than a standard three minute steep. Maybe the only accurate account in a popular source came up by chance in an online group discussion; I didn’t go out of my way to read a lot of different sources citing the same study. Absolutely, you’re right, in no way am I arguing against the science. According to his study, the microwave method extracted 18% more catechins. This is true! This article is mostly railing against the media 1. Getting the method wrong. It’s a minor error, but it’s still wrong, and 2. The ridiculous extrapolations the media makes from a single article and how they offer no explanation, only controversy. Which is why I go on to examine what this data means and why there shouldn’t be an issue, because as you say, the microwave isn’t ever preferable to teaists anyway. Plus, you can get even more extraction by simply re-steeping your leaves! I completely agree, and the article did a great job of covering all that. I wouldn’t have commented if it had been almost anywhere else, the point related to how I see this blog as a source of detailed and correct information. Related to that, there was more background that’s also interesting, about the water seeming to super-saturate with dissolved air due to not having a contact point from a direct heat source to prevent that from happening, leading to a frothy effect. But what you’ve said covers what people should know, and that’s just a tangent. However, I think you failed to call for corporal punishment for the guilty. I made no such omission. Indeed! The foul ruffians could’ve used a good slap!